Rapid fire! Nats mlb.com beat reporter Bill Ladson didn’t even wait seven days to release his latest inbox, this one dated 1/15/14. We just got done arguing about the last one! He must have a huge backlog of questions from baseball-starved fans who can’t wait for pitchers and catchers to report (we’re less than a month away now; Nats report date is 2/13/14). Btw; I heard it from a friend of a friend that the Nats may have given extension offers to both Ian Desmond and Jordan Zimmermann this week; havn’t seen that news pop up on any beat reporter RSS feeds or elsewhere yet. But if true, its good to see the dialog opening up now as opposed to deep into spring training. Stay tuned and lets see if these rumors turn out to be true! Q: What was the reason behind signing Jamey Carroll and Mike Fontenot to Minor League deals? A: Because Syracuse loves having old, over the hill veteran guys playing middle infield for them. No seriously, both Jamey Carroll and Mike Fontenot profile as your typical aging veteran trying to hold on for one last shot, accepting a minor league/non guaranteed contract with an invite to major league spring training so that they can compete for bench spots. And this team absolutely has a need for middle infield depth after trading away Steve Lombardozzi and given the question marks that come with other middle infield options on our roster Danny Espinosa (has he remembered how to hit again? ), Zach Walters (can he actually play shortstop without booting every other ball hit to him? ), and Jeff Kobernus (is he even a middle infielder any more after focusing on the OF for so long)? At this point, I think at least one of them will make the roster unless we make another trade. Ladson says Mike Rizzo loves depth and the team is looking for a backup to Espinosa. Q: At which Minor League level will Lucas Giolito start this coming season after tearing it up with the Gulf Coast Nationals and Class A Auburn? A: In my big system-wide prediction piece in December 2013, I predicted Lucas Giolito will start in Low-A/Hagerstown. There’s no reason not to get him going in full-season ball, and low-A makes the most sense given his age. In a perfect world he’d dominate low-A in the first half and get promoted to high-A/Potomac for the 2nd half. Ladson also says Hagerstown. Q: Am I the only one concerned about Bryce Harper‘s weight gain? A: Bryce Harper is in his low-20s; he was always destined to “fill out” and gain more muscle mass. It will only mean more ferocious power and hopefully more strength to help him slog through the 162 game schedule. On the downside, it means less speed on the bases and probably less range in the outfield, neither of which is really too much of a concern for a premium power hitter. If it means that my dream of Harper playing center field and taking over the reigns from the likes of Mickey Mantle and Willie Mays as premium power-hitting CFers, so be it. Ladson says there’s no worry. Q: If the Nationals give Espinosa or Jeff Kobernus a spot on the Opening Day roster, who would be the first player sent to Syracuse? A: I’d have to think Kobernus would be first expendible player; the team already has too many outfielders (3 starters in Harper, Denard Span and Jayson Werth, a backup in Scott Hairston and a presumed 2nd backup in Tyler Moore). There’ s just no room for a third extra outfielder on modern teams; you need that 2nd bench spot for a guy who can cover the middle infield. Ladson didn’t really answer the question, just saying that Espinosa would be “given every chance” to make the team. Q: Do you think the Nationals would move Ryan Zimmerman to first base and trade Adam LaRoche for a good starter or bullpen pitcher? They could move Anthony Rendon to third base. A: I do not think the team would move Adam LaRoche at this point. You’d get almost no value back and would be creating a hole in your lineup that the team can’t easily fix. If you think a team is going to give up a “good starter” or even a “bullpen pitcher” for a mid-30s guy who underperformed last year, then you’re fooling yourself. Bill Ladson: stop taking dumb trade questions! Back to the question though; the team seems convinced that Ryan Zimmerman‘s throwing issues are behind him, since he’s had more than enough time by now to recover from his Oct 2012 shoulder surgery. Btw, take a look at his baseballprospectus link and look at his unbelievable injury history; I can’t think of another player with such a long list of maladies. Now, once LaRoche is gone and the team is looking at a hole at first, a premium 3rd base defender wasting his talents at 2nd, and a litany of free agent options to provide cover at 2nd and/or 3rd… yes we may see Zimmerman come back across the diamond. Lets see what happens in 2014; if Zimmerman returns to gold glove form, we may be having a different conversation next off-season (as in, who are we getting to play 1B). Ladson talks up LaRoche, calling him one of the best defensive firstbasemen in club history. If LaRoche is so good, we must have really had a bad run of first basement. LaRoche posted a -2.0 UZR/150 last year, good for 17th of 19 qualified first basemen in the league … sorry, hard to talk about how great defensively you are one of the WORST first basemen statistically in the league. You know spring training is coming close when Bill Ladson does two mailboxes in two weeks. Here’s 1/9/14’s version. As always, I write my response here before reading his and edit questions for clarity as needed. Q: Most of the talk about a middle infielder for the bench is centered on Danny Espinosa. What are your thoughts about Jeff Kobernus? I would play him and trade Espinosa. A: I think the talk is focused on Danny Espinosa since, right now he seems like the best option thanks to the trade of Steve Lombardozzi and the lack of any other real competitors. Zach Walters hit 30 homers in AAA … but by some accounts is a very poor defender. I can’t find his minor league fielding stats but others have pointed out that he made 30 errors last year in AAA. Jeff Kobernus has been playing outfield lately; he played 2nd in college and earlier in his pro career but can he even play short stop? New signees Jamey Carroll and Mike Fontenot can both play 2nd and SS … but aren’t exactly MLB quality guys any longer; Fontenot spent the entire year in AAA in 2013 and Carroll is a guy on a minor league contract nearing 40 who hit for a 40-something OPS+ in 2013. Ask yourself; what do you ideally want out of a backup infielder? They have to be a plus defender (apparently knocking out Walters), they have to be able to play 2nd and SS (knocking out Kobernus). Espinosa is a fantastic defender, a short stop in college with a rocket arm who many once upon a time thought was a better short stop than Ian Desmond. Right now, I want to see if Espinosa can re-gain his former self and use everyone else in this discussion as a fallback plan. Trade Espinosa? Can you define the term “selling low?” That’s the last thing the organization wants to do right now. That being said, Ladson continues to be insistent that Espinosa will be traded before opening day. His prediction for the opening day backup infielder is “lets see what happens in spring training.” Strong stance. 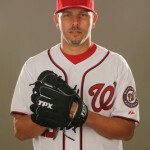 Q: Is Bill Bray still with the Nationals? If I remember, he had health issues. Any chance he could be in the mix for a lefty slot in the bullpen? A: Bill Bray is a Minor League Free Agent, and according to Baseball America is still unsigned. Even if he did re-sign with Washington, it’d be on a minor league deal, meaning he’d have to be added to the 40-man to be in the mix for the loogy. That already puts him behind several guys; Jerry Blevins and Xavier Cedeno for sure, and likely Sammy Solis if the first two guys failed. Bray also has to show he’s healthy, which he hasn’t really done in quite a while now. I hate to say it, because i’ve got a soft-spot for him (he’s from Virginia Beach and i’m friends with his cousin), but he may be looking at retirement. Ladson says he’s not ready until May but wants to stay in the organization; lets hope they throw him a bone and give him a minor league deal. Q: Are the Nats pursuing any other lefty relievers, or is Jerry Blevins all there is to it? A: I’d guess the team is pursuing other lefties, but not actively. I’m sure there will be a couple of MLFA signings here and there to provide some competition in Viera. Ladson reminds us that they’re thinking about both Solis and Ross Detwiler as lefties out of the pen. Q: Any word on F. P. Santangelo re-signing for the 2014 season? A: No idea. I thought he was a fine broadcaster so I hope he comes back; didn’t realize there was a question. Ladsons says they’re both back for 2014, after which Santangelo’s contract expires. Q: Tyler Moore is an enigma. He seems to have all the tools to be a regular .280 hitter with 20 homers. Why does he appear to only be in the Nats’ plans as a bench player? A: Moore is an enigma; is he the power hitting slugger (one homer every 15.6 ABs) in 2012 who bashed his way to an .840 OPS or is the overmatched, strike-out-one-out-of-every-three times guy we saw in 2013? I’d hope he’s closer to the former than the latter, and thus can still be a servicable righty power bat off the bench. Why is he just a bench player? Because he’s not better than any of the guys ahead of him? I would have thought this was kind of obvious, looking at Bryce Harper and Jayson Werth and their accomplishments and status on this team. Ladson assumes Moore is a backup firstbaseman, I guess, but says Moore isn’t going to be platooning with Adam LaRoche either. Q: Do you think it is likely that the Nationals will sign both Ian Desmond and Jordan Zimmermann to contract extensions this offseason? A: Likely? No. I think at least one (Desmond) gets done, and we may see the other guy (Zimmermann) get moved in a cost-containment move with the team thinking ahead to its rising minor league players and its need to pay both Harper and Strasburg sooner than later. Ladson sort of agrees. Ah, what a great way to bring in the new year, with another edition of Bill Ladson‘s inbox (dated 1/2/14). As always, these are real questions from presumably real people, and I answer here before reading Ladson’s answer. 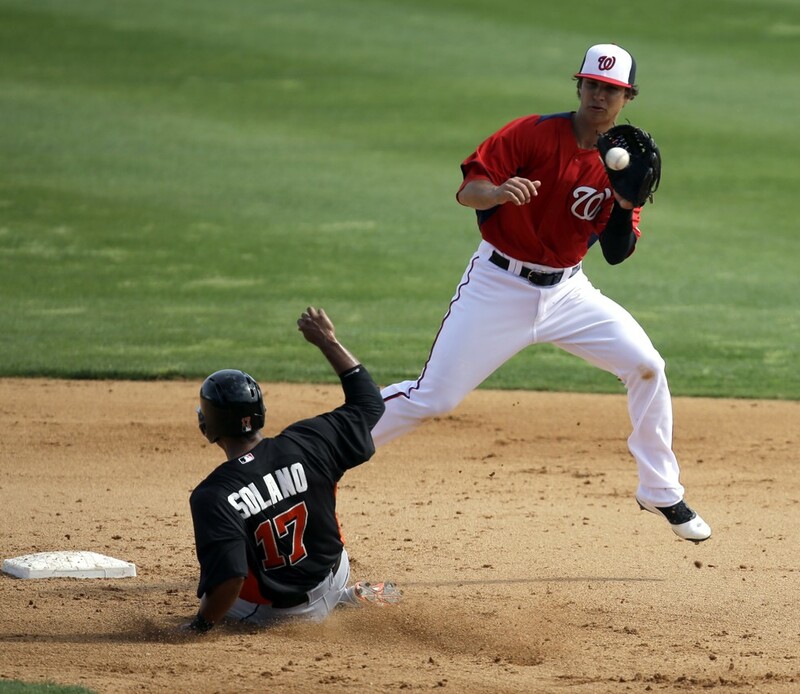 Q: Do you think that Denard Span will be the leadoff hitter, with maybe Ian Desmond batting second? If so, shouldn’t the order be reversed since Desmond is a much better offensive player? A: The answer to this question goes to the evolving lineup construction question and a rising opinion in the Sabre ranks that states that a team’s “best” hitter should be batting 2nd. Joe Sheehan discussed why the Reds specifically should have been batting Joey Votto 2nd instead of 3rd in this July 2013 article on SI.com, but his arguments were less about Votto and more about the idiocy of Dusty Baker‘s insistence on batting a sub-par hitter ahead of Votto all year. The real proof is from Tom Tango in his publication The Book, which is summarized in this 2009 BeyondtheBoxScore post by Sky Kalkman. Basically the argument is that a #2 hitter is slightly more important situationally than a #3 hitter, based on the fact that the #2 hitter bats more frequently than the #3 hitter, often bats with the bases empty and thus needs to be both a high OBP and a high average guy to be able to either set things up for the #3/#4 guys behind him or to do something with the #1 guy who just got on base ahead of him. Now that being said, nothing trumps a good OBP in the lead-off spot. Last year our best OBP guy was Jayson Werth, but he also had the best average AND hit 25 homers. Hmm; maybe Werth is your #2 hitter right now. Desmond’s OBP was slightly better than Span’s on the season (.331 to .327), but Desmond hits for a ton of power. Span is the prototypical lead-off hitter; he’s a lefty, he’s fast, and he normally gets on at a .350 OBP clip (career .351). So right now if it were me I’d be batting Span 1, Werth 2 and Desmond somewhere around #5. Todd Boss the Nats manager puts out this line-up opening day: Span-Werth-Zimmerman-Harper-Desmond-LaRoche-Ramos-Rendon-Strasburg. Good lefty/righty balance, has your best all-around hitter in the #2 hole and your best power hitter in the #4 hole, with Desmond getting more ABs than LaRoche right now and the rest of the lineup cascading down normally. Ladson posts his lineup, which uses more conventional thinking and has LaRoche batting before Desmond. I think he’s wrong there; LaRoche was clearly not a better hitter than Desmond and has no business batting ahead of him in this lineup right now. Q: The Nationals recently signed D.C. native Emmanuel Burriss to a Minor League contract. Is he a viable candidate for a backup role with the club in 2014? A: I think the Emmanuel Burriss signing was about AAA depth, not a real attempt to find a utility infielder who can contribute at the MLB club. Look at his 2013 slash line: .213/.270/.221. Wow, that’s really bad. Of course, that’s still better than what Danny Espinosa did last year … Presumably Burriss is competing with Espinosa and Zach Walters for that backup middle infielder spot. Burriss’s problem is that he’s a minor league/non 40-man signing while both Espinosa and Walters are already on the 40-man … so for the time being I see him with fellow locally-tied minor league signee Wil Rhymes (he went to college at W&M) as Syracuse’s middle infield. Ladson thinks he’s a candidate but not a starter … and then predicts that the team will be trading Espinosa. Q: If Espinosa makes the team as a bench player, my concern is his clubhouse attitude. Do you think management shares this concern as well? A: Great question; who here knows Espinosa personally to see how he may react? 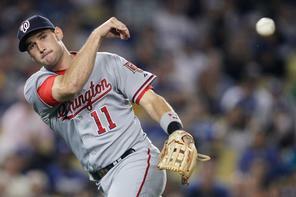 Who here works in the Nationals organization and can effectively judge Espinosa’s character, given everything that’s happened to him in the past year (injuries, performance, loss of starting job and demotion)? Not me, and presumably nobody reading this, so its all just fan speculation. So, given that I don’t know anything about the guy, here’s what I think: He has to realize that a) he’s no longer a starter here and b) he’s not even guaranteed a bench spot thanks to his 27 OPS+ hitting last year. 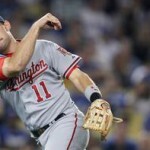 But, he also has to realize that his best shot at this point of regaining a starter job in the majors is going to be to perform, and perform ably, wherever he gets his chance, and thus either improve his trade value to make him more valuable to other organizations or possibly to force his way over someone in the Nats organization. That chance may end up being full time in AAA but it’ll be better for him if he’s at least a backup in the majors. If he doesn’t realize these things, then his representation is doing him a massive disservice (and I don’t think Scott Boras is bad at his job). So my guess is that he’ll swallow his pride knowing he has to be in the majors to show that he can produce in the majors and will embrace his role. There’s also the small issues of money and service time; he’s making peanuts in AAA versus what he makes riding the bench in the majors. And, if he makes the bench for at least 2 months or so in 2014 he accrues enough service time to hit arbitration following next season … which means either a pay raise or freedom to move to another organization where he may not be as blocked as he is in Washington. So no matter what, it is in his best interests professionally and financially to make the team, no matter what the role, out of spring training. One last point: just ONE injury anywhere in the infield opens a massive swinging door for him to not only get playing time but likely to start. He has to be ready. Ladson says Espinosa works hard and that Jayson Werth would get him in line if he had an attitude problem. Q: What is the situation behind the plate? Ever since Ivan Rodriguez retired, it seems that’s been an injury-riddled spot. Why aren’t the Nationals making any moves for a backup catcher? A: Catcher is an injury-riddled spot for nearly everyone in the league; the guys get beat up and miss time no matter if they’re the best or worst guy in the league. I’m guessing the team is actively in the market for backup catchers, but so are a bunch of other teams. I still count 10 catchers out there available in free agency and I’m guessing teams in need are all still jockeying for position with the better and lesser candidates. I’m sure we’ll sign at least one more guy to be in the mix with Jhonatan Solano, Sandy Leon and Chris Snyder. Plus there’s this: nearly every catcher who can still crouch will get a spring training gig because there’s just so many arms that need to throw simaltaneously for these teams. So we’re sure to see more guys sign up. Ladson says they’re trying to acquire more catcher depth but have been unsuccessful. Q: How come Zach Walters is not being given a decent shot at making the team out of Spring Training? He has pop and is adequate defensively. A: I don’t think people are saying that; I think the consensus seems to be that the backup infielder spot is Espinosa versus Walters right now. Who would you rather have? I think i’d lean towards one more chance for Espinosa (the guy did hit 20 homers in 2011 after all) and then either trade him or move him out. The concern with Walters (despite his 29 homers in AAA in 2013) is his strike-outs; they’re pretty high. You put up with 1 K/game if you get 30 homers … not if you get 10. He hit nearly 30 in AAA; can he do that in the majors? Ladson points out an important note; new manager Matt Williams knows Walters from when they were both in the Arizona system. Hmm. Will that have an effect? 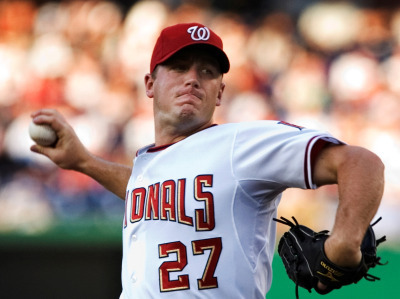 Q: Would you try to get Eric O’Flaherty on the Nats if you were Mike Rizzo? A: I’m not sure I would; he had TJ surgery in late May 2013 (5/21/13 specifically), meaning he’s looking at likely a May 2014 return date. So he’s likely missing the first 2 months of the season, and even then he’s on a shorter leash next season. Is this what the Nats need? My guess is that he re-signs an incentive deal with Atlanta out of some sort of professional courtesy for having gotten injured on their watch. Ladsons agrees with me and thinks he goes back to Atlanta. Q: Shouldn’t the Nats bid on pitcher Masahiro Tanaka? A: Bid yes. Go crazy and blow $20M/year on the guy? No way. Scouting reports thus far seem to indicate that Masahiro Tanaka is good but not Yu Darvish-good. And this team needs to start thinking about extending its own known quantity guys versus blowing that money on a lottery ticket like Tanaka. My guess is that a team with deeper pockets (Los Angeles, New York) or a team with more desparation (Seattle) agrees to pay Tanaka just ridiculous amounts of money. Ted Lerner seems to be indicating we’re nearing the team’s payroll budget and we’re going to start having to get creative fitting in some of these mid-to-upper level talents we have now accumulated. Ladson doesn’t really consider the merits or consideration of Tanaka, instead just saying the rotation is set. I’m not sure that was the question. Well, it isn’t like I didn’t have enough content to publish this week (with 7 seasonal reviews coming out, each of them between 1500 and 3000 words). But Nats mlb.com beat reporter Bill Ladson had to come out with an inbox on 12/19/13, so lets do some rare weekend posting so we can talk about the system-wide pitching staff projections on monday. Q: Are the Nationals done as far as improving the team for next year? A: I don’t think so: I still see a veteran catcher, a better backup infielder, and another lefty in the pen as possible acqusitions. On my little “off-season Nats todo-list” the only one of these that I think *must* happen is the backup catcher. Per mlbtraderumors.com 2014 FA Tracker I see some names still out there that could work: John Buck i’ve heard in rumors somewhere, and someone like Kelly Stoppach could work. Honestly I havn’t done a ton of research on veteran backup catchers, so these may be awful suggestions. Right now whose your backup infielders? Are you ready to go to war with either Zach Walters or Danny Espinosa in that role? Steve Lombardozzi got 300+ plate appearances in 2013, more the year before. Jerry Hairston got 238 PAs in 2011 while Alex Cora ot 172. Basically the point is this: your backup infielder is going to get a LOT of at-bats. You need to have someone reliable. I would not entirely call either Walters (lack of experience) or Espinosa (apparent lack of capability) proven right now. 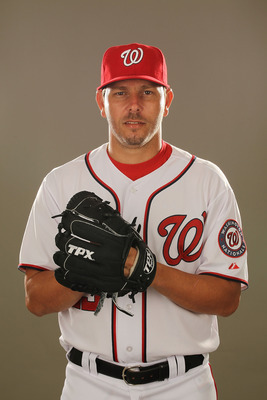 I don’t see the need to go all out for another lefty reliever, but i’m also not Mike Rizzo. We have some options internally that we could use. Ladson mentions middle infield and a backup catcher as well, and then surprises me with his mention of Shin-Soo Choo, a personal favorite of mine who I’d love to see here hitting lead-off and playing LF in the short-term. But not in center, where he proved he was awful last year, and not for 7 years and 9-figures like he seems to be set to get. I’d be absolutely shocked if the Nats committed those kind of dollars for Choo, given his age and likely fall-off. Q: With MLB looking to ban home-plate collisions, could you see the Nats giving Bryce Harper a chance behind the plate if Wilson Ramos can’t stay healthy? A: No way. It isn’t just about collisions; its the wear and tear, its taking a guy’s bat out of the lineup once or twice a week. Harper was never going to be a full time catcher, not with his once-in-a-generation premium bat. Ladson agrees. 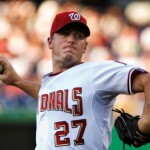 Q: Do you think pitchers Nathan Karns, Lucas Giolito and A.J. Cole will be used in spot starts this season? A: Karns yes, Cole doubtful and Giolito no way. It all comes down to 40-man roster manipulations. Right now Karns is on the roster so he can get called up and down every week and it has no effect on anything but his service time accumulation (which teams have shown lately that they’re less and less concerned about). Cole, if he dominates in AA could see a similar call-up to what Taylor Jordan and Karns got last year … except that the team has significantly more starter depth this year. Maybe Cole can be a 9/1/13 call-up; he is rule-5 eligible after the 2014 season and will have to be added to the 40-man roster anyway. As for Giolito, there’s just no way he’s sniffing the majors until he’s ready. Right now he’s the prize asset in the farm system and he needs to develop so that he can arrive in the majors right as the team needs to make some key decisions on personnel. Ladson agrees. Q: Could you please explain to me why Zach Walters is only No. 11 on the list of the Nats’ top prospects? The numbers he put up last season are pretty amazing. A: Mostly people seem to be concerned about his OBP, which has dropped at every level and was only .286 in Syracuse last year. 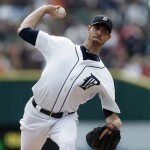 He has always struck out a ton; 134 in 134 games last year, more or less averaging a K/game for his ML career. That being said … you don’t find guys who can hit 29 homers and play Shortstop on trees. And last I checked, you trade off some OBP and some excessive K’s for guys who can hit a ton of bombs. Maybe scouts are just in denial. Lots of people think the team should flip him now based on his 2013 season, but if he can do anything close to those numbers in the majors he’s doubly-valuable. Ladson thinks he’ll be ranked much higher in the 2014 rankings. 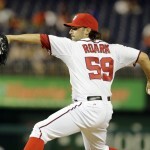 Q: Who do you think will win the fifth spot in the Nationals’ rotation? A: That’s the question of the off-season. We’ve argued about it over and again here, and will again next week when I post system-wide predictions. We’ll save the arguments for then. 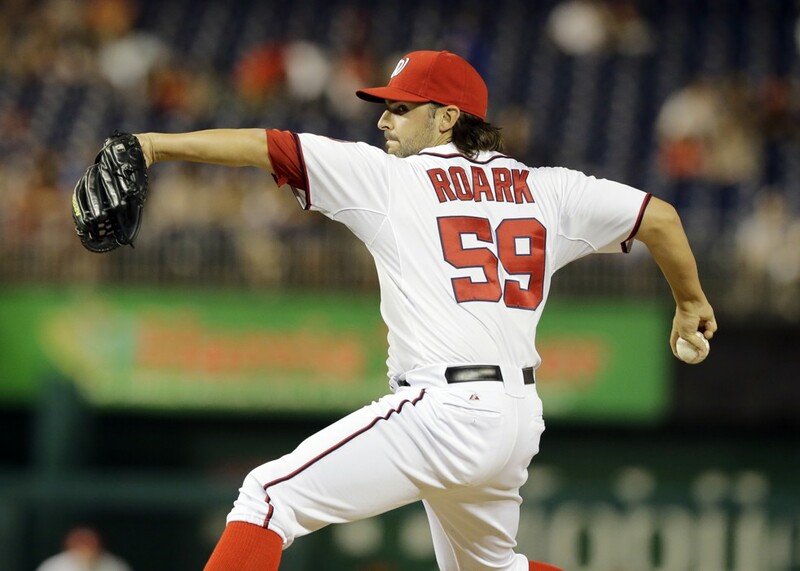 Ladson says Tanner Roark, which surprises me frankly. Lets save arguments on this for my big prediction piece next week. Q: Do you think Espinosa will be a valuable backup for the Nats? A: Boy I hope so. But something holds me back; what has changed from the point he was demoted til now? He hasn’t gotten his shoulder fixed. He hasn’t stopped switch hitting. All he did was go to Syracuse and continue to hit poorly. Why at this point would we think he’s going to do anything better than what he’s already shown us he can do? Ladson expresses some doubts too.